I was pleasantly surprised to open the back page of this past weekend’s New York Times Sunday Book Review section to an article on the 100th anniversary of H.G. Wells’ “Little Wars.” The book’s Edwardian-era style, classism and occasional not-so-thinly-veiled sexism is mixed with the mechanics of a gaming system which makes it a relevant read even today. Before “Little Wars,” wargaming had largely resided in Europe’s war colleges and in the parlors of the ruling elite. Even with its English intellectual, upper-crust trappings, “Little Wars” sought to expand the popularity of wargaming. 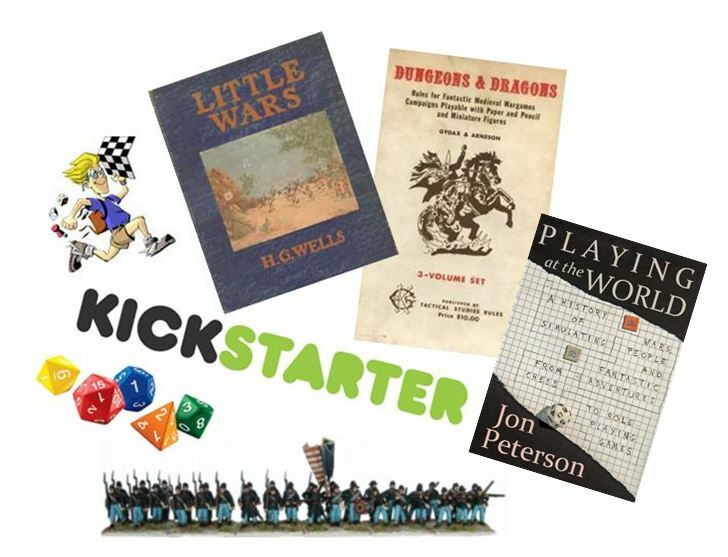 As the article points out, “Little Wars” is an important foundational document and should be required reading for those who are interested in how we’ve arrived at the business of gaming on the tabletops and screens of the world today. “Little Wars” is widely available for free online and for e-readers today, and “ownership” of gaming is largely the subject of a post today on BoingBoing about Dungeons & Dragons retro-gamers. Whether driven by nostalgia or as a reaction to corporate ownership of a beloved game of their youth, “old school” D&D gamers stress what they believe to be a truer game style more focused on role-playing and less-so on action-driven play. To stay relevant to a new generation brought up on CGI special effects, so the argument goes, the now-owners of D&D Wizards of the Coast have increasingly made the game more combat-heavy (read: more like video games). In reaction to this, retro D&D gamers have created an increasingly-active community of story-driven gamers who look to old rules for inspiration. The ability to share thoughts, opinions and out-of-print rulesets online has only fuelled the movement. Old school gamers are just the latest combatants in the war over gaming. The history of wargaming rules development winds its way from military schools and H.G. Wells to postal games and strategy boardgames in the mid-20th century. Games and rules were more fluid in the 1940s-60s where there was little profit to be had in wargaming, and a big part of the gaming community was in the debates over what rules were the most realistic or playable. With a few exceptions, ownership in those days was based more on pride and ego than copyrights and profit. This timeline is well-documented in Jon Peterson’s “Playing At The World” which finally arrives at the early days of D&D. Even before D&D made the great leap into a world-wide phenomemon there were arguments and accustaions over copyright and ownership. Peterson’s recent analysis of a transitional draft of D&D (the Dalluhn Manuscript) not only adds greater nuanace to the development of the rules themselves but I think also provides another chapter on the concepts of evolutionary, intellectual and legal ownership of games. Much of the digital conversation today — whether about games, photos, movies or music — hinges on the topics of openness, control and copyright. Along with the free and independent gaming forums and sites, we’ve now been given a new frontier of games on Kickstarter. What used to take years (or even decades) of slow development and debate by word-of-mouth fanzines and postal newsletters, Kickstarter achieves in weeks or days. Players vote with their wallets in support of games which can now easily garner six and seven-figure funding levels, all but guaranteeing a fanbase that literally buys-in at the ground floor. Sites like BoardGameGeek can help make or break the success of a new game and then go on to serve as R&D for game expansions, rule variations and subsequent editions. A hundred years after “Little Wars” pulled the ownership of wargaming out of the fists of Europe’s elite, we’re still warring over our games. Copyright laws, digital distribution and individual financial investment will continue to shape the next hundred years of the ownership conversation, but gaming is certain to remain a very personal investment for some time to come, too.